I have soldiered on knitting. A very nice Ravelry.com member reached out to me and pointed me in the direction of the Katy Cowl. I know, what is up with the picture? That Vogue envelope looks crazy! But yes, I also have Vogue 8815 coming up. I am making it as part of Craftsy's Plus Size Pattern Fitting and Design with Barbara Deckert. From what I have watched so far, there is a ton of pattern and fitting information for those of us with wobbly bits. She really goes into a lot of information on grading patterns up to fit anyone no matter what size. I am especially looking forward to the rounded abdomen and rounded upper back videos ( I prefer Dowager's Hump as it makes me feel so Downton.) Also, there is a tutorial to make your own dress form using tape and paper. She also teaches you to make three variations on the pattern: a work version which resembles a button down blazer, a lady that lunches version which looks Chanel and a play version which looks like a zip up jacket with slot seams. I can't wait to make that one! But wait! There's more! The good people over at Craftsy are offering Stacie Thinks She Can readers the class for only $29.99. Thanks Craftsy! If you are not particularly interested in this class, check out Craftsy anyway. If you sign up for their mailing list, they will send you great discounts on classes and updates on new ones coming out. How is it going? I love cables, but I am totally baffled by purling. 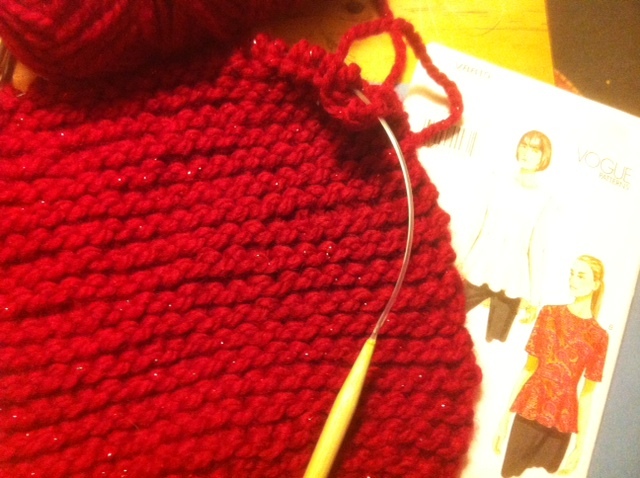 It is going slow - I don't have cable needles so I am making do with what I got - purling does not bother me at all... I love to see that pattern taking shape as I continue to do the repeats!! Hi- thanks for the Craftsy note....but I think something is wrong with your link. I'm doing this class too. And enjoying it. Looking forward to seeing your top. I already purchased some teal coloured raincoat fabric (not plastic!!!) to make the sporty one into a raincoat.